On behalf of the librarians and library staff of the Leatherby Libraries, I’d like to invite you to explore the many library resources available to alumni. In order to utilize our vast collections of library resources and services, Chapman and Brandman University alumni must obtain an Alumni ID card. Present the card at the library along with a government issued ID in order to borrow items. Chapman Alumni: Click here to sign up for a Chapman Alumni ID card. Please allow 7 to 10 working days for processing. Contact the Alumni Relations Office at (714) 997-6681 or alumni@chapman.edu if you need assistance. Brandman Alumni: Click here to sign up for a Brandman Alumni ID card. Please contact Alumni Relations at alumni@brandman.edu if you need assistance. We invite alumni to peruse the extensive book and media collections throughout the Leatherby Libraries. Read about the nine libraries here. Please read the Alumni Circulation Policies to identify which library resources and services are available to alumni with a valid ID card. These policies include the types of print resources you may access, including checkout privileges, times, renewals, and late fees. The Online Public Access Catalog (OPAC) is freely accessible to alumni. The OPAC contains the records of our print and online holdings. Database access is limited to in-house use only at the Leatherby Libraries. Please ask at the reference desk or circulation desk for access. Online database access for off campus alumni is not allowed. Reference librarians are available to answer questions about the use of library materials and provide advice and guidance on conducting research. Visit our Ask a Librarian page. The Leatherby Libraries offers media rooms for viewing DVDs and other audiovisual materials and study rooms for small groups. Please read the Room Booking Policy for Media and Group Study Rooms for details. Alumni are welcome to view the many wonderful exhibits and displays throughout the library and to attend events that are designed to engage the Chapman community through literary, scholarly, and cultural partnerships. See the library’s News and Events page. The Leatherby Libraries opened in the fall semester, 2004. The five–story facility serves as an intellectual and cultural heart of the campus and is designed to meet the information needs of Chapman’s students, faculty, staff, and alumni. The library is open 127 hours during the Fall and Spring semesters of the academic year. Our innovative library combines the latest information technology with the personalized attention that is the hallmark of a Chapman education. It includes nine individually named libraries with distinctive collections representing disciplinary areas of the University: arts and humanities, social sciences, science and technology, education, music, film and television and business and economics. In addition, two special libraries are located on floor four and are named the Frank Mt. Pleasant Library of Special Collections and Archives and the Sala and Aron Samueli Holocaust Memorial Library. The facility features 14 group study rooms, six multi–media preview rooms, one multi–station music listening area. 92 computers for user access, wireless Internet access available throughout the building, six computer classrooms, a dedicated library instruction room, an extended-hour study commons, and more than 800 seats at tables, carrels, and lounge chairs. The Leatherby Libraries’ collection contains approximately 519,000 titles including DVDs, videos, CDs, and other media, 370 print journal titles, access to 75,000 plus full text electronic journals, 260 online databases, and 160,000 electronic books, supporting the research and curricular needs of the campus community. Additionally, the library offers a range of lectures, exhibitions, permanent art and curriculum–related displays throughout the year, and now houses two permanent archives collections located in the lower level of the building. The California Gold Archives and the Center for American War Letters Archives are open to alumni during posted hours. 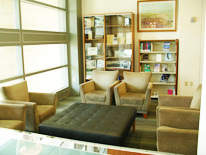 This is a great place to relax and read a book or view the new alumni displays. Why not browse the collection of books by Chapman alumni authors? They are housed on a special bookshelf in the alcove. View our collection of alumni publications. To suggest an alumni title, please email us.